When George W. Bush used the term "axis of evil" to describe Iran, Iraq and North Korea in his 2002 State of the Union speech he was derided from all sides. Post-modernists and others among whom ideas of good and evil are quaint but obsolete, sneered that Bush was a simplistic thinker. Others, who agreed that threats to their existence might be evil, seemed less troubled by the ethics than by the accuracy of the term "axis." Bush, by linking these three nations, was accused of misunderstanding that members of an axis work together. As Iraq and Iran were mortal enemies, so went the argument, there was no evidence of cooperation. In 2002 it may have been impossible to prove Iranian-North Korean cooperation, but that has changed. Since at least 2012 when the two countries signed a technological cooperation pact, Iranian and North Korean scientists have been openly cooperating on so many projects that Iran, if it is not already doing so, will likely evade IAEA inspections by testing its weapons in North Korea. Whether through prescience or luck, Bush was correct about the Iran-North Korea connection. With Saddam out of the picture the "Axis of Evil" has become the "Duo of Evil" -- not nearly the same ring. There also is evidence that the Duo is seeking to recruit a new third member to complete the axis. Putin's Russia, for instance, could easily be taken for a new member of the axis. Its fingerprints have been showing up in many places: the murder of Russian dissidents, the downing of passenger jets, the invasion of its neighbors. Putin's decisions to cancel the transfer of S-300 surface-to-air missiles to Iran and withdrawal of troops from Syria suggest a Russia making a strategic retreat for its own best interests at the moment, whatever they may be. China might also part of the axis. Constructing military bases on artificial islands indicates a budding expansionism. China's reportedly growing dismay over North Korea's antics, however, suggest a nation too concerned with its own interests to join any axis seeking to destroy the chief marketplace for its goods. Cuba shares with Iran and North Korea a deep hatred for the US and a history of autocratic rule. The less obvious, but more probable, recruit to the axis is Cuba, which shares with Iran and North Korea an institutional hatred for the USA and a history of autocratic rule. Robin Wright has called Cuba and Iran "melancholy twins." Most bitterly of all, all three countries might today be far less threatening had U.S. aid not saved them at crucial moments when their tottering regimes might have been toppled. Had Jimmy Carter not pulled the regime out from under the Shah, the Iranian Revolution might never have caught on. Carter's shameful treatment of an imperfect ally is a blight on his presidency. But when the so-called Green Revolution broke out in 2009, a newly inaugurated President Obama did nothing to help the revolutionaries. Worse, he reached out his open hand, eventually placing billions of dollars at the mullah's disposal just when sanctions were crippling Iran's economy. In 1994, North Korea was not yet a nuclear power. Its economy was almost non-existent, and an ailing Kim Il-Sung was losing the battle of world opinion after the IAEA declared it in violation of non-proliferation safeguards. Just when international opprobrium might have been leveraged against the regime, a semi-retired Jimmy Carter saved the Kims with the worst diplomatic deal the U.S. had ever made. The subsequent Clinton-Carter Agreed Framework provided Kim Jong Il (whose father died during negotiations) regular shipments of heavy fuel oil and, of all things, two light water nuclear plants. In return, Kim promised not to do what he immediately set about doing. The now-infamous photograph of Kim Jong-Il and Madeleine Albright toasting the deal is an iconic tableau to diplomatic folly on par with Neville Chamberlain triumphantly waving a piece of paper with Hitler's promise to behave himself, or more recently, John Kerry and Zarif shaking hands over the JCPOA. Cuba has been flaunting its tyranny since Obama's outreach, with 8,616 political arrests in 2015. Now Cuba is being saved just when its repressive dictatorship was finally vulnerable and fading on the vine, bereft of the welfare it enjoyed first from its Soviet patrons and then from Venezuela's Hugo Chavez. 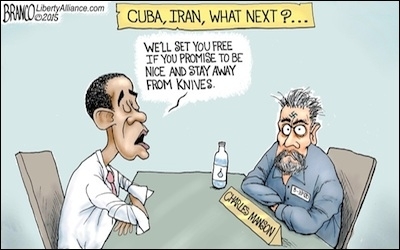 Obama's diplomatic engagement with Cuba's octogenarian dictators will ensure that the island prison stays in business. Like Iran, Cuba has been flaunting its tyranny since Obama's outreach, with 8,616 political arrests in 2015. Historical similarities aside, Cuba has cooperated with both Iran and North Korea. Under the Shah, Iran had no diplomatic ties with Cuba; but after 1979, Castro was one of the first nations to recognize Khomeini's regime as the legitimate government of Iran. Since then, ties between the two have been increasing steadily. In May of 2001, Fidel Castro visited Iran, where he said "Iran and Cuba, in cooperation with each other, can bring American to its knees." Visiting Cuba at a meeting of the Non-Aligned Movement (NAM) in 2006, then Iranian President Mahmoud Ahmadinejad thanked the Castros for their support of his country's nuclear program; he visited Cuba again in 2012; by 2014 the relationship had grown even closer. Cuban relations with North Korea are neither as old nor as easily documented as those with Iran. Aside from Castro's visit to Pyongyang in 1986 and some weapons transfers in the 1980s, there had been little to report, until recently. The Economist offers 2008 as the year that cooperation between Cuba and North Korea began increasing. In 2013, the North Korean ship Chong Chon Gang was interdicted in Panama after leaving Cuba laden with Soviet weaponry hidden under mountains of sugar. There were MiG jets, spare MiG engines, missile parts, radar components, and other weaponry. There were reports that the ship had visited Cuba several times before being caught with the weapons. What else might have been smuggled out of Cuba is far less worrisome than what might have been smuggled into Cuba. A Cuban role in the axis would be more than ideological. Just as the USSR did not subsidize Castro's tyranny for the good cigars, so too Iran and North Korea are less interested in old weapons and luxury goods than in the one thing Cuba has always offered to America's enemies -- physical proximity. The USSR used Cuba as a forward operating base in the Cold War. Why would Iran and North Korea not do the same? Most analysts are focused on North Korea's intercontinental ballistic missiles (ICBMs), but a medium-range missile fired from Cuba could reach most of the US. Cuba would also be a good launch point for an electromagnetic pulse (EMP) attack on the US. Just days before North Korea's purported hydrogen bomb test, the State Department reached out to Kim Jong Un with another lifeline offer. And on March 17, the US removed Cuba from the list of countries deemed to have insufficient port security. In spite of repeated Iranian violations of the JCPOA, there is no sign that the so-called "snapback sanctions" are even a topic of discussion at the White House. Last week, Russia used its veto at the UN Security Council to prevent any sanctions on Iran. The biggest difference between the Bush and Obama approach to the "axis of evil" is that Bush was opposed to it; Obama appears infatuated.